About once a week, I am contacted by a sports management graduate student to discuss possible internships, career paths, specific aspects of our department operations or some other angle on college athletics. I enjoy the conversations and in fact welcome them. The most recent version of this exchange occurred over the weekend. A graduate student asked me to define the exceptionally vague concept "Sports Leadership". I can envision the class discussion now - a three hour seminar sorting out what it means to be a leader in sports with no clear answers. Here's my attempt at defining the concept in college athletics. Sports leadership isn't a thing but is a person. It is individuals making a difference everyday in the lives of student athletes. It's head coaches working to get the most from their athletes while keeping their eyes on a prize that is part championship, part graduation and part growth and maturity fostered from their mentoring. It's assistant coaches spending long hours on the road recruiting finding individuals who will fit into a championship culture in the hope of someday becoming a head coach. It's alumni, recognizing the transformative experience they had during their college years and donating to their alma mater to improve facilities, endow scholarships and provide annual support that is crucial in today's economic environment. It's equipment and facilities staff working very early and very late, usually in the shadows, to make sure that the soccer pitch is like a billiard table and helmets are properly fitted to prevent a concussion. It's compliance staff following the rules and finding a way to protect an institution's integrity while simultaneously wanting to win and asking good questions to help make it happen. It's travel administrators and business office staff making sure the buses arrive on time, that teams have enough hotel rooms, that all the meals are scheduled properly and the bills are paid on time. It's custodial staff who take pride in their facilities, making sure the garbage cans are empty and the venues sparkle. 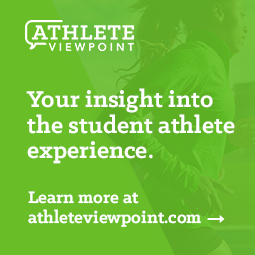 It's academic advisers demanding success and rejecting excuses from student athletes, some of whom are pushed to their limits in the classroom, so that each one can achieve a diploma and maintain their eligibility. It's strength coaches who find the physical limits of an athlete and work to make them stronger than they thought possible so that they are as fresh in the last minute of a game as they were in the first. It's athletic trainers and team doctors treating and rehabilitating injuries that leave athletes separated from the on-field activities of their sports and struggling through the hard work of physical therapy. It's athletic communications, event management, ticketing and marketing staff getting people to the games and doing their best to make sure the coverage and support of each team is positive and robust. It's athletic directors making a difficult decision to back a coach who is going through a rough stretch, because they know that the coach still has command of the locker room and that success is close at hand, despite what the media and fans may think. It's all of these people, in these roles, along with countless others too numerous to list here doing their best every day to make their programs the best that they can be. A football game under the lights on Saturday night with a full stadium is one of the great environments in college sports. It's different from a day game. There is an added buzz from a full day, or week, of anticipation. Driving to the stadium, there is a glow that you can see from miles away, drawing you in. 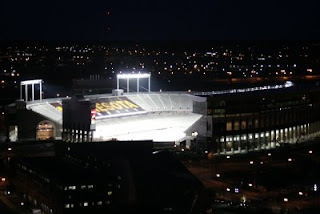 Sports leadership has a glow that attracts you like stadium lights in the distance. Once you're in the stadium, you look up at the lights above the top of the stadium and there is a sharp contrast between the white hot lights against the pitch black sky, like the difference between right and wrong. Seeing that distinction and having the courage to make the right choice, that's sports leadership. And when you look at the banks of stadium lights, one light by itself won't let you see much. Collectively, they illuminate the field. But when you look at the bank of lights and one is burned out, you notice. Usually the other lights effectively compensate, but too many lights without power diminish the environment. Working collectively, never letting your light go out and making sure that you cover your area of responsibility with intensity that shines so that your student athletes, teams and university are the best they can be -that's sports leadership. No matter what role you have in college athletics, shine on. Fantastic article! It is a testament to all in college athletics who demonstrate "sports leadership" on a daily basis. Each of us can and should shine in our own way. Enjoyed the article. Great reminder that leadership is about people and how they choose to leverage their influence. I believe the key is building a culture where this spirit is viral. Many coaches have leadership cults; not cultures. Student athletes today thrive in an atmosphere that models servant leadership. This is terrific! I am going to share this with my students ASAP.